The Mid-Atlantic Regional Center for the Humanities, also known as MARCH, is housed in a 19th century historic row-home. 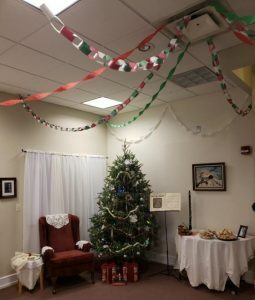 This year marks the third year of the center’s residency in the Cooper Street home, and the third year of holiday decorating. This December, Dr. Charlene Mires handed over leadership of the decorating project to Public History graduate student William Krakower, who volunteered vivaciously for the position of lead-decorator. The fully decorated MARCH house made it to the final round of judging for the University’s contest, falling in with two other finalists.Chancellor Haddon visited the house today for another look at the 1918 theme; the results of the contest will be announced on Friday, December 14, at the Chancellor’s holiday party in the Campus Center, from 2:30-5:30pm. Our fingers are crossed for the MARCH house – awesome job putting this together, William! We are always so proud of the various activities our graduate students are involved in. 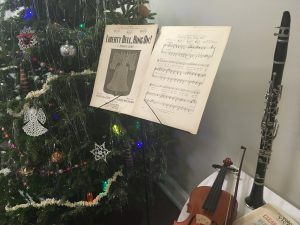 Posted December 12, 2018, by Mckenna Britton in Student News, What's New?. Graduate student Amy Osterhout has only been working with the Old Baldy Civil War Roundtable for a few months, but already her involvement with the organization has proven beneficial. Osterhout manages the group’s social media presence, namely their Facebook page, and uses snippets from the Old Baldy monthly newsletter, promotes the group’s monthly meetings, and posts ritually throughout the day, making sure that those that follow the page stay up-to-date and informed on the latest Old Baldy news. Since starting with the group in late August, Amy has helped to increase the number of “likes” on the Facebook page from 915 to roughly 970. She hopes that the group can reach her personal goal of 1,000 likes soon – with her help and dedication, surely itwill happen! 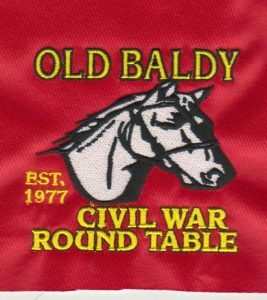 Provide Amy with an extra boost by visiting the Old Baldy Facebook page, and stay up-to-date with all things Civil War. Keep up the great work, Amy! Posted November 7, 2018, by Mckenna Britton in Student News, What's New?. The Swan Foundation Scholarship is a $5,000 fellowship awarded to a graduate student with interests in public history. This scholarship is administered by the Mid-Atlantic Regional Center for the Humanities (MARCH) at Rutgers-Camden. This year, the Swan Fellowship has been awarded to graduate student Will Krakower. We extend a hearty congratulations to you, Will! Posted September 11, 2018, by Mckenna Britton in Student News. Welcome back, students! Poor Richard’s Junto, the Graduate History Club on the Rutgers-Camden campus, wishes you only the best on your first day of classes, and presents to you their September/October Newsletter as a comfort for the back-to-school stress you may be feeling. Visit the club’s Facebook page for routine updates and posts! Posted September 4, 2018, by Mckenna Britton in Information & Resources, Student News, What's New?. 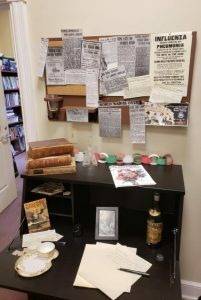 Congratulations to McKenna Britton, one of our graduate students, for developing and installing her exhibit, titled “The Frosh Enter the Fray: Rutgers-Camden Freshmen of the 1950s and 1960s,” in the Paul Robeson Library. The exhibit pulls excerpts from freshman handbooks, editions of the campus newspaper The Gleaner, and images from Rutgers-Camden yearbooks in order to introduce students to the rules and regulations that the freshmen of decades past had to abide by—and the various ways they rebelled against the upperclassmen. Stop by the library to learn what the first few weeks of the fall semester looked like for freshmen in the mid-twentieth century, figure out what a “dink” is, and feel relieved that freshmen no longer need to collect 30 signatures from fellow classmates a day. 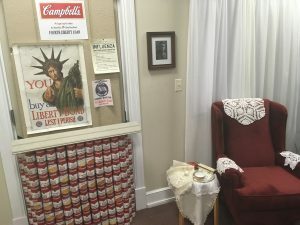 The exhibit will be on display in the lobby of the library until October 14, 2018. Posted September 3, 2018, by Mckenna Britton in Student News, What's New?. Page last updated by Graduate History Blog at 2:12 pm September 11, 2018 . 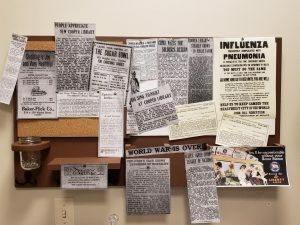 This page was printed from http://graduatehistoryblog.camden.rutgers.edu/category/student-news/ at 2:33 PM Friday, April 19, 2019.